The Wildlife Seed Program is an important conservation activity of QUWF. Several national seed companies offer surplus seed to QUWF annually. The seed consists primarily of grains used to develop winter feeding and cover sites for wildlife; and it is available to QUWF chapters, members and conservation partners across the United States for use in food and cover planting projects. Types of seed offered are: corn, forage sorghum, grain sorghum (milo), soybeans and wheat. The seed must be planted and left standing for Wildlife. Availability of seed is entirely dependent upon what is declared surplus by the seed companies each year. Seed is shipped to the chapter by the semi-load, which is usually 858 bags, unless other arrangements are made. The seed is in 50lb. bags. Cost of seed to the chapter is explained as follows: a fee of $2.75 per bag and cost of trucking. ln addition there may be an additional fee chapter handling and shipping. Some seed plants may also charge a minimal re-tagging fee. Our chapter may recover a small of no more than $2.00 per bag. To charge more is considered a sale of seed and is not permitted. 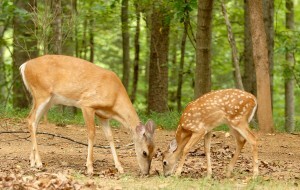 Food plots are used to provide a wide variety of foods for a host of wildlife species. Typicaly they are planted to an annual agricultural crop, such as corn or milo, to provide a high energy source of food for wildlife in the winter. interest in other types of piants for food plots, such as ladino ciover for green browse or forage sorghum for escape cover and food, has increased in recent years. The use of food plots can provide important food and cover plants-planted and natural-resulting in an increased abundance and diversity of foods available to a wide range of wildlife species. Grain plots also create important brooding/bare ground habitat. Existing vegetation should be controlled with an herbicide and/or disking prior to seeding. Perennial food plots may be seeded during the dormant season (November-February), or in the spring on a prepared seedbed by either broadcasting or drilling the seed. Dormant seedlings are preferred. Seedbeds prepared with disking should be cultipacked or rolled before and after planting. For dormant season plantings, the seed may be broadcast and rolled if the existing vegetation has been eradicated and more than 30% mineral soil is exposed. Food plots come in two main types: (1) grain plots designed to provide seed; and (2) green browse food plots which offer succulent vegetation for wildlife forage. In some instances, the two can be combined. Food plots can also be created by leaving unharvested grain strips along edges of crop fields. For grain food plots, planting should be done early enough to allow adequate time for the crop to produce mature seed. Planting grain mixtures rather than monoculture crops will enhance benefits to a wider range of wildlife species. In general, grain plots or unharvested grain crop strips should be a minimum of 0.25 acres in size, at least 30 feet in width, and preferably located adjacent or within 70 ft. of good woody escape cover and diverse herbaceous cover. Create long, linear plots to divide large fields or block plantings where strips are not desired. Establish plots so that soil loss is within tolerable limits, and planting on the contour is recommended. When possible, utilize no-till planting methods. The residue left by practicing no-till planting methods will harbor insects beneficial to wildlife. Food plots should be adequately fertilized and protected from livestock grazing. In most cases weed control should be limited, as the ’natural foods’ provided by annual weedy plants are important to many wildlife species. Plots adjacent to woodland edges may need to be wider than 30’ to lessen the impact of reduced production due to competition for sunlight and moisture. ln general, one plot per 40 acres of farmland is a minimum. Seeds produced on small plots are often exhausted by wildlife early in the winter; where possible consider increasing the plot size to one to two acres to provide longer-term benefits. In general, plots larger than four acres in size are unneeded. To maximize food diversity, establish a rotation where half of the grain plots are left fallow each year to allow native food plants (annual broadleaves and grasses) to establish. Replant this fallow area the next year, and leave the other half of the grain plot fallow. Including a legume in the rotation, such as alfalfa or annual lespedeza, every 3-5 years will help to build and maintain soil fertility. Green browse plots should be located adjacent to quality wildlife cover, and a minimum of 0.25 acres in size. The food plot site should be open and accessible for establishment and future maintenance. The use of correct amounts of nutrients and maintaining desirable pH levels is important to ensure quality. Properly timed mowing can help to promote actively growing vegetation, especially for perennial plantings, and increase its attractiveness to wildlife. Mowing July 16 September 30 is desired. Plots can also be mowed March 15 May 1. It is recommended that only one-half of the plots be mowed annually, and that mowed strips are rotated, to increase plant diversity. Avoid planting aggressive non-native legume species. *this mixture is best used if planted in separate rows, eg. two rows of corn & tow rows of grain sorghum. If planting only one species, grain sorghum (milo) will generally provide the best results. * Rates can be reduced 50% for planting or drilling, except for soybeans, which could be reduced to 34-40#/ac. FertilIzation of grain food plots is strongly recommended, especially for corn, milo, and sunflowers, to develop adequate seed production and fertilizer should be applied based on a soil test. lf a soil test is not available, apply a blanket rate of 1500 pounds Effective Neutralizing Material lime, 30 pounds Nitrogen, 90 pounds Phosphate, and 90 pounds Potash per acre. Leave half of grain plots fallow each year to provide natural foods and diversity. Rotate this sequence the following year. Use proper fertilization to provide optimum benefits. Renovate and re-establish green browse plots every 3-4 years, or as needed, to maintain food values. Maintain shrubby escape cover adjacent to food plots. Consult with NRCS, VA DGIF, or Virginia Tech Extension for additional recommendations.